If you conduct yesterday’s exercise a few times, it’s fairly likely you’ll encounter a common problem with most websites: the dead-end page. Someone has progressed along one of the many paths through your site, and now they’re at a page where they can go no further. This, very simply, should never be allowed to happen. Now, I’m not talking about the ever-present get-out-of-jail-free card of a standard header or footer that always lets people get to some of your key starting points again — that’s not progressing: that’s simply going back to the beginning. No, I’m talking about harnessing the momentum someone already has. Someone is merrily moving through your site, sufficiently engaged to actually click links and do/discover more, rather than just bouncing straight back out to somewhere more appealing. If they get to a page where there’s nothing obvious to do, or nowhere obvious to go next, then you’ve lost them. There are two main ways out of this problem. The second, more indirect approach, which I’ll talk about in more detail later, is simply to make sure that everything that could be a link is one. But ideally you should also have something much more direct and obvious that you want people to do from this page. You site may be super tightly focussed, with only one thing it’s trying to drive every visitor towards. Or there might be lots of options. Either way every page should be clearly and explicitly helping people towards at least one goal — and it should be obvious to anyone looking at the page what that is. If someone is simply browsing at your site out of curiosity, you don’t even necessarily need to drive them towards some other form of action yet — you can simply provide them more options to go deeper, or view other similar pages. One particularly effective, but often-overlooked option is to let them sign up for alerts when something new happens — when there’s new information on this topic, or when a person concerned does something else, or even just when someone adds a comment to the page. The options will differ depending on what the page is, but the key underlying approach is the same absolutely everywhere: after someone is done with this page, make sure there’s something obvious for them to do next. When building a website most people give most attention to the front page. After all, that’s probably the page that will be viewed most often ((Although, if most of your traffic comes from google searches, or deep linking from other sites, both of which we’ll talk more about later, that may not even be true)). One or two other key pages probably get quite a lot of care and attention too. But after that there’s usually a sharp drop-off, with many pages looking like they were simply knocked up in 15 minutes by a developer who hasn’t had his morning coffee fix yet. This is often the cause of the great disconnect between what you and your friends think of your site, and what the rest of the world thinks of it — you judge your site by its best bits, but people who actually use it judge it by its worst. When it comes to a great user experience, every page matters. A well known large corporation, renowned for making job applicants go through many, many rounds of interviews, uses one of those interviews in a very simple and effective way. In it the interviewer takes one single point mentioned on the candidate’s CV/resumé, and quizzes them on it in-depth for an hour. The vast majority of people have something in there that, even if it’s not an outright lie, is still somewhat embellished, or wishful thinking — maybe an exaggerated account of what they achieved at a previous job, or a skill they haven’t actually used since that one job 10 years ago, or an interest that’s really been dormant since college. Pretty much everyone has something in there that’s unlikely to withstand an hour of deep questioning. On a semi-regular basis you should carry out a similar process for your site. Whether this is something you’re actively in the process of building right now, or something that’s been running happily for 10 years, pick a single page, grab everyone you can (and maybe some pizza) and spend a hour digging into it in painful detail. Look at it in several different ways. Print it out and hand it around — some copies in colour, some in black and white. Blow it up on a big screen or projector. Look at it on a mobile phone. Listen to it on a screenreader. Even look at it upside down. Can people tell at a glance what page it it is? How do people get there — both from within the expected flow, and also from elsewhere: do people come to it from Google searches? If so, for what? Has anyone ever linked directly to it from Twitter? Why? What can you do on the page? Where can you go next? If you have real facts and statistics about all these things that’s good (you should! ), but don’t look at them until after you’ve discussed what you think the results will be. Then try to work out why the answers are different (they will be). Try to look at the page through fresh eyes. Then go find some people who’ve never used the site and see how their fresh eyes differ from yours. Don’t even tell them what the site is: what can they tell just from looking from this page? If they found themselves on this page, what would they think they should do? Why does that differ from what you think they should do? If this was the only page they ever saw, what would they think of your organisation? Does it entice them to want to discover more, or do more? Or do they just shrug their shoulders and return to Facebook as quickly as possible? Again, if your TODO list doesn’t grow dramatically from this exercise, you’re doing it wrong. Comments Off on What is Usability? If you want your site to be successful, how usable it is is much more important than what features it has. By that I don’t mean that usability is important, and is something you really need to consider and spend time on. No, I mean it’s completely vital — it should be where the vast majority of your work goes. There are many different ways of thinking about what usability actually means, but for now we’re going to take one very simple approach: it’s a measure of how easy it is for someone to use your site who isn’t already a domain expert. If you’re building a Freedom of Information site, can someone who has never even heard of Freedom of Information clearly and easily do what you want? If you’re tracking Members of Parliament, what does your site look like to someone who actively hates politics, and knows nothing at all about the Parliamentary system, or what bills are, or hasn’t even the faintest clue what MPs actually spend their time doing? For every page you build, you need to step back, look at it like a first-time visitor, and ask: does this explain what the page is about, why I’m here, what I’m meant to do now, how I can find out more, etc., or does it assume I’m already an expert? In the vast majority of cases, the primary reason you are building the site in the first place is because the official sites already act like everyone is an expert, and NGO sites assume everyone wants to become an expert. Your goal is to build a site that non-experts can use. This is far from easy. The chances are you’re already an expert yourself — and if you’re not, then you’ll probably become one in the process of building the site. And once you’re an expert, everything makes sense to you. It’s hard to go back and pretend like everything is foreign to you again. But it’s OK for this stuff to be hard. Even if you go to the gym every day you’re not going to see much effect if you only spend 5 minutes there doing things that are easy. Usability design is the same: what every page of your site does; how every element of it hangs together; what the things are that someone can do next — these are tough questions. If each of these decisions is easy to make, you’re almost certainly going to have no effect. You’ve simply built a site that’s good for you, but bad for your users. There are many approaches you can take to do this sort of thing better, and we’ll be talking about lots of them here. But finding out how well you’ve actually done it is remarkably easy. Simply get three people who haven’t used your site before, and who aren’t experts in your area, and persuade them to spend five minutes using your site while you watch. Don’t tell them anything about the site in advance — especially not what the site does (it’s really easy to make that mistake whilst trying to persuade them to help you!) Just ask if they’ll spend a few minutes with this new website you’re working on, and talk out loud about what they’re doing (or trying to do) as they go. You can’t answer any questions they ask — in fact you can’t say a single thing. All you can do is listen, and watch. If paying attention to how each of those people interacts with your site doesn’t give you thousands of dollars worth of advice you’re either already one of the best usability designers in the world, or you’re doing it wrong. Comments Off on Who Is Your Audience? Today we consider another of the deep questions that must lie behind any site: who is your audience? This is, again, a seemingly simple question, but which often exposes a lot of unchecked assumptions or faulty thinking. In part this is because it’s really two questions, often confused, closely related, but with very different answers: Who can use your site, and Who will use it. The difference is subtle, but worth thinking through, because too often people don’t take the time to figure this out and end up with the opposite to what they hope for. You’re never going to get a site that everybody will use, but you want to build a site that anybody can use. Too many people aim at everybody ((I’ve seen proposals that expect 90% of the adult population of their country to be using their site within a year)), and end up with something that’s only usable by lawyers, or journalists, or political wonks, or FOI geeks, or people who are already activist supporters of whatever you’re trying to do. Those people should certainly be part of your audience, but your job is to go much broader than that ((unless you’re explicitly targeting only that niche, in which case you’re almost certainly not part of my target audience here.)). To be successful your site needs to be usable by people who aren’t already your supporters, who don’t understand all your technical language or the inner workings of your political, governmental, or legal structures, and (more importantly) don’t want to understand that, and shouldn’t need to. It is, of course, much harder to build sites like that. But that’s what we’re here to discuss. I’m sure we’ll return to some of these deep metaphysical questions from time to time, but next week we’re going to get into much more practical hands-on User Experience issues. Comments Off on What Are You Doing? This should be an easy question to answer, but I’m surprised by how often it isn’t. 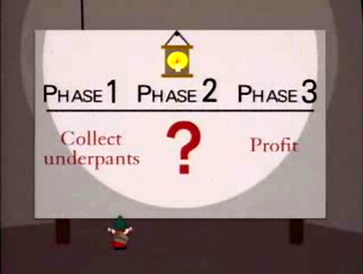 I encounter this a lot when I review funding proposals: often they fall into something akin to the underpants trap. Groups are often highly effective at describing a problem in their society that they hope to address ((often in way more detail than needed as if people are going to disagree that the highlighted issue is a Bad Thing)), but then they jump right into explaining the functionality of the website they’re going to build, skipping completely over the crucial middle step of how that’s going to help. I used to think that it must just be self-evident to the groups how the site they’re describing will solve the problem, and that I’m just being incredibly dense by not be able to discern that part, but I’ve seen this enough times now, and had enough follow-up “clarifying” conversations to realise that a lot of times, groups simply have no idea what they want their site to actually do. They (usually) know what they want the end result to be in society, but not how their project will help get them there. In fact they often seem to not even realise that these are two different things — their goal is no more nuanced than “Solve this problem”. And thus we end up with lots of sites with nothing but a vague approach of “raising awareness”, and no way for anyone to actually get involved or help move in the required direction ((other that like-ing, retweet-ing, +1-ing etc which might help raise more awareness, but won’t get you any closer to your goal unless all these people can actually do something)). This sort of website is fundamentally no different to handing out leaflets in the street — it may be slightly more efficient or cheaper or easier to reach a wider audience, but it doesn’t take advantage of any of the disruptive abilities of the web. It’s like a bookstore spending millions of dollars on online advertising to promote its mall store, as it has no online shopping facilities. And even most old-skool activist groups figured out a long time ago that leaflets are much more effective if they try to get someone to do something, rather than just educating people about a problem. Now, lest you misunderstand my point here: I’m not talking about adding a highfalutin “Theory of Change” section to your proposal. I certainly think having such an idea is valuable ((and Aaron Schwartz does a great job contrasting change-driven approaches from action-driven ones)), but I’m talking about something much simpler — being able to explain clearly what someone using your site will be able to do there. To take a common example, let’s say your area of interest is Freedom of Information in your country. Most countries have at least one NGO working in this area, monitoring how well government establishments are responding to information requests etc., and producing regular reports, full of complex tables and pretty bar charts. Then they decide to build a website. The default approach seems to be little more than taking the quarterly reports and put them online, maybe with a whole new educational section on how you can make your own requests. WhatDoTheyKnow.com, on the other hand, has been hugely successful, and hugely disruptive, because it took an entirely different direction. The vast majority of people don’t care about Freedom of Information statistics — and that’s not simply because of the sorts of quantitative vs qualitative things us FOI nerds like to argue about, but because to most people, the only thing that really matters is whether they can successfully obtain information when they need to. And it turns out that catering to those people — removing as many barriers as possible (both technical and psychological) and making it as simple as possible for them to make a request, and layering on some extra transparency-driven-embarrassment incentives for government officials to actually provide the information, or for other users of the site to help when they don’t — not only makes them happy, but can very quickly snowball into something which has huge impact on the entire culture of access to information across your country in the process. The trap of “Something must be done. This is something. Therefore we must do it” is seductive, and as easy for activists and NGOs to fall into as it is for governments. So make sure you take the time to understand what your something is, and then spend even longer trying to make it a better thing. I want to kick off the discussion here with a few deep metaphysical questions: peering into the very soul of who you are, what you’re doing, what you want to achieve etc. Don’t worry, we’ll get on to some lighter stuff soon enough, but it’s worth taking the time to reflect a little more generally first — when I talk to NGOs and activists etc I’m surprised just how often people can’t adequately explain even what they’re doing, never mind why. But let’s start with the easier question: who you are. At the very least you should know the answer to that one! If you’re reading this there’s a fairly high likelihood you fall into one of two key groups: you’re either part of an NGO or activist group, wishing you had access to better programmers or technology skills, or you’re a geek/hacker trying to use those skills to directly make your society a better place. These days a lot of effort goes into trying to bridge these two groups, largely on the theory that bringing them together can help each achieve more. Generally I’m quite sceptical of that approach, though. It’s not that it never works of course (for pretty much everything I’m ever going to write here there are going to be well-known exceptions), but generally the dynamic in this relationship is all wrong. The assumption is usually that the ideas come from the NGO side, and then some programmers are brought in to do the fiddly work to actually Make It Happen. The business world used to work like this — the first big internet bubble was full of smooth talking MBAs raising lots of money for their dot.com ideas, hiring programmers to create the sites, and then sitting back to count their money. If you look at the businesses that actually survived from that period, however, most of them were the opposite of this. They was driven by geeks and techies and hackers who came up with ideas, created great sites and products, and then brought in some adult supervision to fill the gaps in their abilities. As Paul Graham has pointed out, you’re much better starting with a Bill Gates and later hiring a Steve Ballmer, than starting with Steve Ballmer and hoping he can hire a Bill Gates. Absolutely the most totally essential thing is to be an organisation of amazing, politically minded coders, not an organization employing or contracting good coders. Their skills are your lifeblood, their ideas your bread and butter, and finding the best civic hackers in your country and building your organization around them is the only path to success. And that means they should be making most of the day to day decisions, not you, you ignorant, arts-degree-clutching clot. But, what if you’re already an existing NGO? Does that mean there’s no hope for you at all? Well, not necessarily. But you certainly need to take a very close look at the dynamics of who you are, and who makes decisions and how. Jeff Bezos’ maxim that the old world of “location, location, location” has been displaced by a new world of “technology, technology, technology” is as true for activism as for retail. If you’re trying to build an online project that will actually make a difference, it needs to be a living, breathing entity, driven by people who both care about the issues and can create the technology required. You can’t just dream up a site, outsource the development, have it built, and leave it be. 99% of the time that’ll just get you a mediocre me-too site that might gain some initial interest, but will slowly fizzle away into irrelevance. Instead, you should — at the very least — surround yourself with as many great civic hackers as you can find. Ideally, however, you’ll go even further, and work on becoming one yourself. It’s not essential that you’re able to write every line of code yourself, but the more you can gain a deep understanding of what actually goes into building something, the more you’ll be able to make better decisions and the better the projects you create will be. On The Road, part 2: Southeast Europe. Over the last couple of weeks I’ve given presentations about this project, and about mySociety in general, to multiple groups in Tallinn, Vilnius, Kyiv, and Chişinău. Over the next month I hope to give a lot more. But what I’ve learned from the last trip is how much smoother everything runs if there’s someone in each city helping arrange meetings for me: either setting up some 1-1 sessions with local groups or, ideally, bringing together a whole bunch of activists, hackers, and NGOs at once for me to present to and discuss the project with. So I’m hoping to find some helpful people who’ll volunteer to help with that in the places I’m going to in the next few months. If anyone in any of those cities would like to help put this all together with me, please, please, get in touch! And, even if you can’t help out, but would like to meet up when I’m any of these places (or know people I should talk to in them), again, please, let me know! But I’m also hoping to meet with people “on the ground” in as many of the countries as possible over the next few months. This will happen in two main ways: the first is by attending lots of events — BarCamps, MediaCamps, BridgeCamps, Free Software Groups, OpenCoffee mornings, etc. etc, and presenting the work of mySociety and similar organisations and encouraging others to do likewise (whether through this project or not). The other is meeting individuals, organisations, or smaller groups along the way in the places I pass through. For both of these things, my schedule is largely in your hands! Do you want me to come and talk to people where you live about this project, or mySociety, or transparency and accountability websites in general? Then please invite me! If you’re in one of the eligible countries, then I’ll do my best to visit. (We’re a small charity, so if you can contribute to travel costs or put me up somewhere overnight then that would be appreciated, but if you can’t afford it it’s not necessary.) I can give presentations of any length from about 20 minutes to several hours, or I can just chat informally over coffee — it’s up to you. Firstly, I’ll be attending MediaCamp Kyiv on November 7th. Currently I’m probably going to fly, but if there were people to meet on the way I could happily go by land and stop off in Lativa, Lithuania, or Eastern Poland. Afterwards I’ll probably be staying in Ukraine for a couple of days, then travelling down to Chişinău and București. Then, on November 21st I’ll be in Bratislava and could travel from there down in Hungary or up into the Czech Republic or Poland. Thirdly, at the start of December I’ll be attending e-Society.MK, which, if I can arrange it, could be part of a several-week-long Sofia-Skopje-Priština-Tirana-Podgorica-Sarajevo-Beograd-Zagreb-Ljubljana trip.